1. What is Italian Renaissance Learning Resources? Italian Renaissance Learning Resource is a freely available site featuring eight units, each of which explores a different theme in Italian Renaissance art. 2. 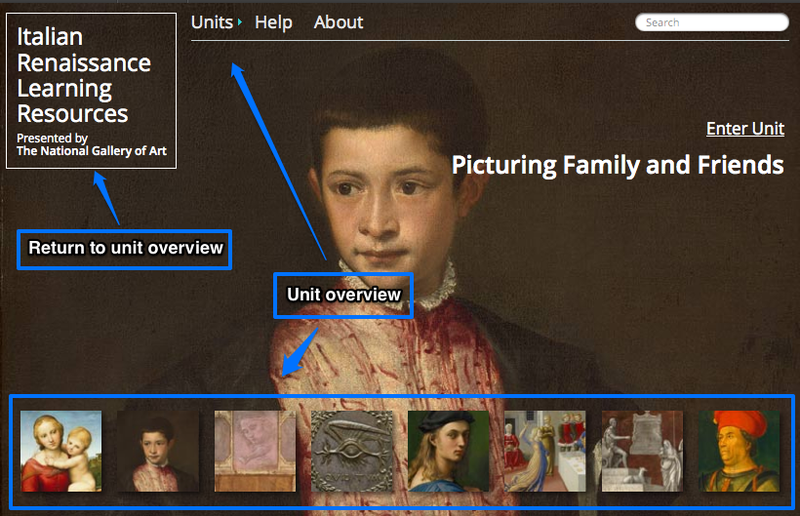 What features and functionalities does Italian Renaissance Learning Resources offer? The site offers various essays on different themes from Italian Renaissance art, supported by over 300 images, 300 glossary terms defined by Grove Art Online, 42 primary source texts, and 34 printable activities and discussion questions for use in the classroom. The site also links to Grove Art Online to encourage further research (subscription required). 3. How do I submit a comment? If you would like to submit a comment or question, feel welcome to contact the Oxford Art Online staff at oxfordarteditor@oup.com. 4. Does Italian Renaissance Learning Resources require a subscription or purchase? No – the site is completely free. However, please note that while certain Grove Art Online content is freely available via the glossary in Italian Renaissance Learning Resource, if you would like to link through to more content in Grove, you or your institution must have a subscription. If you do not have a subscription, you can recommend Grove Art Online to your librarian. The Italian Renaissance Learning Resource site is composed of eight units, each containing multiple essays, images, activities and other supporting resources. The site also contains a number of global tools to assist in reference and navigation. This help section provides a quick overview of each of the main components. The homepage provides a graphic overview of all units of the site and can be returned to at any time by clicking the site title box in the upper left-hand corner of each page. The eight units that make up this site serve as the main organizers for all content. These units can be accessed from the home page or the Unit pull-down menu in the upper left of all pages. Once in a unit, a submenu of options specific to that unit is displayed. Each Unit is composed of multiple essays, which can be accessed through the units landing page or from the Essay pull-down menu displayed within each unit. Each essay is composed of one long page. The paging arrows upper and lower right of each essay page can be used to move between the individual essays that compose a unit. See the tool section below for a description of each of these tools. The images section of each unit contains a full catalog of all of the images referenced. Each image can be clicked to display a larger image as well as the associated catalog reference. 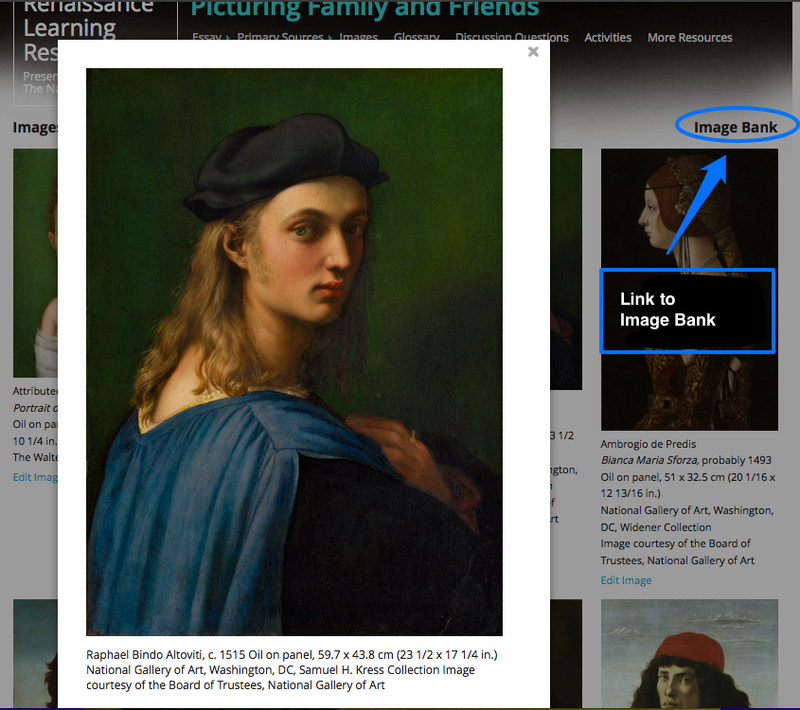 The Image Bank link in the upper right of the image screen provides access to the full catalog of images referenced in throughout the entire site. The primary source section of each unit contains excerpts from relevant writings from the Renaissance period, such as letters, literary works, and theological texts. An index on the left side of the page provides an efficient method for navigating the content of this section. Each unit contains a glossary listing terms and biographies referenced within it. Once within a unit’s glossary, an index along the left side of the page can be used to browse all included terms. An option to See All Glossary Terms provides access to the full glossary referenced in throughout the entire site. Many glossary terms contain a link to an expanded version of the definition through Grove Online. Users must have a Grove Online account to access this extended functionality. Each unit contains a set of discussion questions for use in classroom teaching environments. The scope of these discussion questions varies based on the unit and include notes and tips for teachers utilizing the questions. 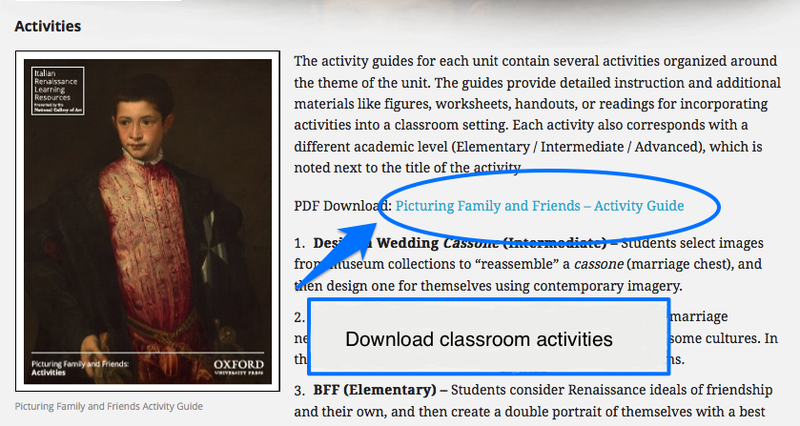 Many of the units contain an Activities component providing a visual guide and resources for classroom activities related to the unit. The Activity page contains a short overview of the activities as well as a link to download a full-color, printable activity guide. The More Resources section of each unit provides a list of additional references and links to more content related to the topic of the unit. An interactive glossary tool is embedded throughout all of the essays. Available terms are presented in bold with a light underscore. When an available glossary term is moused-over a tooltip pops up indicating that a definition is available. Clicking an available term presents a modal window containing the term, definition and author. An additional link is provided to an expanded version of the definition through the Grove Online web site. Users must have a Grove Online account to access this extended functionality. Footnotes are embedded throughout each essay in superscript. Clicking any of these notes will open the related reference in a new window or tab. Simple interactive rollover diagrams and images are available in select essays. These interactives are indicated with a labeled link that opens the interactive in a new window or tab. A number of links to external resources are embedded throughout the site and indicated as blue underlined links. Clicking these links open the external site in a new browser window or tab. A site-wide simple search field is located in the upper right of the page. Search queries all pages, but does not search image captions, printable activity guides or the glossary. The search defaults to searching for two or more terms as “and” (ie. early period would return all pages containing both the words early and period). Each page of the site has been print optimized so it may be cleanly printed without background graphic and unnecessary interface elements using the browser’s built-in print functionality. An outline view of all site content is available through the Site Map link at the bottom of every page. The site is been optimized for Firefox, Chrome, Safari and Internet Explorer browsers 9.0 and higher.